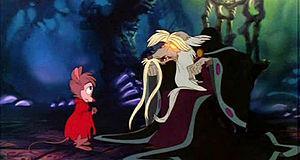 Critically acclaimed 1982 animation The Secret of NIMH was significant in that it was the first film directed by the esteemed Don Bluth after he had broken away from Disney. A former animator at the House of Mouse, Bluth had left to set up his own production company. And his first feature-length effort would turn out to be the adaptation of Robert C. O'Brien's book "Mrs Frisby and the Rats of NIMH". Bluth would later go on to direct classic hits like An American Tail. At the time of the film's release, Bluth and his fellow animators were dubbed the "Disney Defectors" in the press. Famously, Disney was not experiencing great fortunes in the late 1970s and early 80s and NIMH owed few concessions to the cutesy style associated with the studio. A dramatic and often frightening children's story, it centres on a timid field mouse (named Mrs Brisby in the film for copyright reasons) who, in order to save her sick son, must seek the help of a group of rats – the subjects of human experimentation. 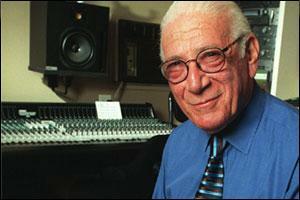 One of the masterful decisions made by the crew was the choice to enlist Jerry Goldsmith as composer. NIMH would in fact be his first animated score and Goldsmith admitted that the medium was initially alien to his sensibilities. However, as with all the genres that he tackled, Goldsmith unlocked the conundrum with one devilishly simple and enormously effective move. Instead of "mickey-mousing" the action in the manner of past masters like Carl Stalling, he instead decided to score the film as he would a live-action project, emphasising the emotional core of a given scene instead of accentuating what's apparent on-screen. It proved to be a genius move (as did most things with this fabulous composer) and helped lend a riveting sense of dramatic momentum to the film itself. The end result is one of the greatest animated scores of all time and one of Goldsmith's personal favourites. On the DVD commentary for the film, Bluth explains how Goldsmith put in an extra three weeks overtime on the score, such was his love for the project. The results are immediately apparent. 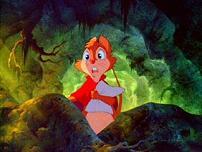 Goldsmith was going through a remarkable purple patch in the year he scored The Secret of NIMH. And the score's "Main Title" bears inflections of his masterful work on Poltergeist, composed around the same time. Beginning with a mystical choir and swirling, enticing orchestrations, it gradually builds into beautifully romantic heights. A gorgeous solo trumpet then ushers in the first statement of the glorious main theme for strings and celli. Entitled the "Flying Dreams Lullaby", it's a truly lovely piece and makes regular appearances throughout the score. Later on, it receives a heart-wrenching, beautiful vocal rendition by Sally Stevens and a slightly more naff, dated one sung by Paul Williams for the end credits. It's all change in the second track, "Allergic Reaction/Athletic Type", the first of the score's many action set-pieces. Beginning with a stark cello, the music suddenly erupts into one of Goldsmith's patented action cues, in which the orchestra is exploited to its absolute limit. The music is so uncompromisingly bold and dramatic one could be forgiven for thinking it wasn't composed for an animated feature at all. From here, the score proceeds to alternate between this thrillingly exciting action music and the soaring interludes for the film's more fantastical sections. "The Tractor" is a genuinely gripping set-piece, built around one of those fantastic Goldsmith action motifs that hurtles forward at a tremendous pace. Such action music rivals any written for a live-action film. 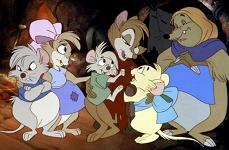 "The Sentry Reel/The Story of NIMH" then takes the score into decidedly darker directions. The choir re-appears and Goldsmith then introduces a doom-laden piece for swirling strings as the disturbing history of NIMH is revealed. The scene in the film is famous for its unflinching depiction of experimentation on animals, and Goldsmith's hugely dramatic score only adds to its effectiveness. The energy rarely lets up in the second half of the album. "Escape from NIMH/In Disguise" features some masterful flighty woodwind sections, with more beautiful variations on the main theme coming in "No Thanks". Thereafter it's pretty much action all the way. The lengthy "Moving Day" expertly builds tension across several minutes before erupting into enormously aggressive music in the final two, as Goldsmith scores the film's terrific climatic swordfight between hero rat Justin and villain Jenner. Taking a leaf out of the classic scores of Korngold, it's truly adrenaline-pumping stuff. The score then reaches its moving pinnacle in its final two tracks. "The House Raising" begins on a note of anguished, turbulent urgency before the Flying Dreams theme rises up in extraordinary fashion. The choir and orchestra reach astonishing proportions and the listener's spirit is sent soaring. "Flying High/End Title" then concludes the score with another heartfelt and beautiful statement of the theme, with some exceptional work for strings and brass. It's an enormously rousing conclusion for an enormously rousing score. 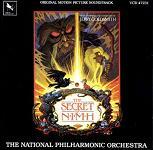 The Secret of NIMH truly is a remarkable piece of work, one of Goldsmith's finest scores and one of the finest ever composed for an animation. That Goldsmith was able to sustain such dramatic tension in a genre renowned for musical "mickey-mousing" was an incredible achievement, and helped pave the way for animated scores to follow. Alan Menken's scores for Disney and Goldsmith's 1998 classic Mulan are just some of the scores indebted to NIMH's legacy. 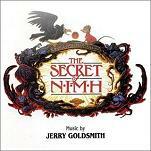 NIMH emerged at a time when Goldsmith was at the peak of his musical powers. In the same year, he also composed Poltergeist and First Blood. The year before, he'd scored the final Omen instalment, The Final Conflict and the years before that had seen the likes of The Boys from Brazil, Alien and Star Trek: The Motion Picture. It's an astonishing run of achievements and NIMH deserves to be held up there with them. A full-blooded, brilliant score, brimming with depth and compassion, it's a masterpiece. The soundtrack album can be found at Amazon.co.uk and Amazon.com. The Sentry Reel/The Story of N.I.M.H.